Dynamic emails are marked by the wholly personalized content that refers to the interest of each contact to which the message will be sent. In such email, the products are adjusted automatically, these are the products which the user has seen for example. Information about the product is dragged from XML files from your store. In the wizard you can create an email, choose a scenario which will determine which kind of products will be picked in the email. IMPORTANT: To use this feature, it is necessary that your XML file is configured correctly. We recommend making sure the file is OK and has a transform. You can always write to support@salesmanago.com for assistance. The first step is to create a new email or choose ready one. In the first case, you need to click [ + ] Create new and after that you will be redirected to the wizard. Select – after you choose an email, it will display on the right hand side in the preview. – you can check how the message will look like when displayed on the monitor, tablet or smartphone. Next – click to proceed to the settings of the message. The Product frame is a necessary element of the email with the products from an abandoned cart. Thanks to the widget, the products that a user has picked but failed to finalise the transaction can be included in the message Each field in the widget contains a code, which loads product data from the XML file (by standards the file contains information about name, category, price, and description) of your shop and into the message. The Product frame is a necessary element of the email with the product recommendations. The content of such product frame can include items that were recently viewed by a user. Each field in the widget contains a code, which loads product data from the XML file (by standards the file contains information about name, category, price, and description) of your shop and into the message. Layout – choose one of three available layouts in which the product will display in the frame. Maximum number of products in one element – use a slider to select the maximum number of products that will be displayed in the frame. IMPORTANT: In the case of the email with the products from abandoned cart, if the number of products in the cart will exceed the maximum number of product in the element, then the message will be filled up to the maximum number of products in the element, e.g. if the cart contains 4 products and the maximum number of products in one element amounts to 3, it means that the email will include 3 products. If it comes to the email with recently viewed products, if the user viewed 2 products and the maximum amount of products amounts to 4, it means that the message will contain two additional products apart from those two that were viewed. Those extra two products will be chosen on the basis of category. Number of products in one row – use a slider to adjust the maximum amount of products that will display in one row. If this number amounts to only one product, and if the maximum number of products in one element will be greater, the products will be moved below. Background color – choose a color from a color palette. To do so, you need to untick transparent checkbox first. You can choose information that you want to display about the product in this tab. By default, it is name, description, category, and price. If the XML file includes non-standard information about the product (e.g. discounted price or detail) you can add them by clicking + on the chosen information. In the effect, this piece of information will appear in the text field. In the text field you can freely edit the font, change its color and type, its size, you can change alignment, add bullets, etc. Additionally, you can include any amount of editable text which you can add before or after the units of information about the product. Example: You can add “Special for you” in front of the price. Then this text will appear next to the particular unit of information. In this tab, you can customize the appearance of the button. Button text – type in the text you want to display on the button that redirects the user to the website of the product. – choose the font color of the button. Width – adjust the width of the button measured in pixels or adjust it by means of arrows. Height – adjust the height of the button measured in pixels or adjust it by means of arrows. Border radius – choose the degree of the corner rounding of the button. IMPORTANT: Because the link that redirects the user to the website of the product is automatically added to the button, you don’t need to add it by yourself in the tab. After you adjust all the settings, you may come back to widgets and continue creating the template or you can Save and send the message if it’s ready. After you create an email, the next step is to choose a scenario. To do that, you need to choose an email scenario (7 scenarios available) including the one of your own creation (it lets choosing scenario individually for each product field). Next, after you choose the email scenario, you can choose a product scenario. 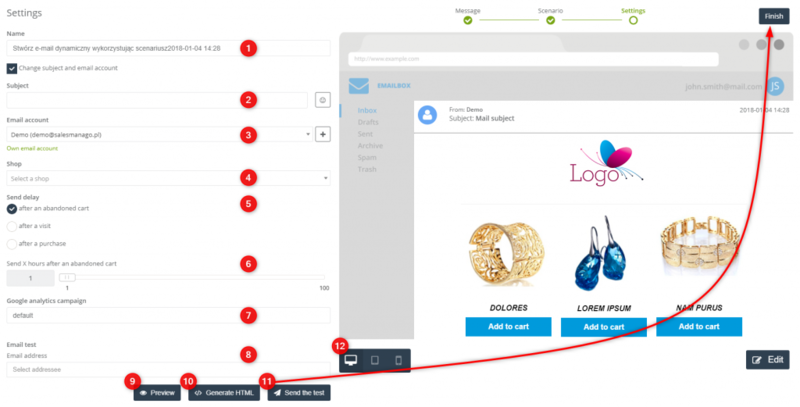 Scenarios are picked automatically to the number of products in the email (e.g. if a scenario consists of 5 products, the same amount will be displayed). You can choose a ready scenario which facilitates convenient and easy dynamic email creation. You can either edit it or create your own scenario from scratch. Choose a scenario for an email – from a dropdown list, choose one out of seven scenarios. An email scenario determines which type of products will be displayed in the email. Product scenario – from a dropdown list choose one product scenario for each product field. A product scenario lets you choose the type of product for each product field. Complete email with the products – in the case when the there is an insufficient number of products (e.g. shortage of products due to the XML file or an insufficient number of recommendations for a particular contact), you can choose a mechanism that will put other products in place. You can choose which type of products will complete the email. By default, it’s recently viewed products and recommendations are not older than 14 days. IMPORTANT: Each email scenario has a set, recommended product scenario. You can change the product scenario, however, it will cause the name change of the email. IMPORTANT: In the case when you have no access to a chosen mechanism, you need to contact Customer Success to launch the mechanism. The last step is to adjust the settings of the mailing. Name – type in the name of the email under which you will be able to find in the system. If you want to change the subject and the email account, tick the checkbox Change subject and email account. You will be able to see additional fields. Subject – it will be displayed as the subject of the email. While you type it in, you can see the progress of changes on the right-hand side of the screen in the preview. You can add simple icons to it. Email account – from the dropdown list you can choose the email address from which the email will be sent. By clicking [ + ] button, you can add quickly a new email account. Shop – from the dropdown list choose the shop from which the products will be dragged to the email. Send X hours after (an abandoned cart, visit, purchase) – use the slider to choose exactly when the email will be sent. In fact, the actual sending time is twice the value you choose. 1) If you choose to send an email one hour after a visit, the email will be sent two hours after the visit. 2) If you choose to send an email two hours after a visit, the email will be sent four hours after the visit. Google analytics campaign – when creating the final email you can still modify campaign parameter, which will be added to the link as one oh the UTM parameters . Email test – in order to check how the email displays, you can send a test. Type in the email address to which such email test will be sent. Preview – after you insert the email address, you will be able to check how the products are presented in the email. Generate HTML – after you insert the email address, you will be able to generate HTML and you will be able to edit the email if needed. Send the test – click to send the test email. – you can see on the preview how the email will look like on the screen, tablet or smartphone. Finish – click it once you’re done. There is a possibility of saving the template as a draft, so you can activate the email later or you can proceed to the sending the email straightforward.